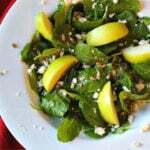 This is a recipe for a super healthy Kale and Apple Salad topped with a sweet and tangy cider dressing. 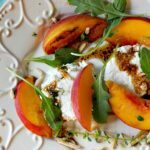 This is a recipe for Grilled Peach Salad with Arugula and Goat Cheese. 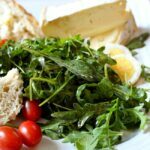 A fun toss between a salad and a cheese course. Grill peaches to give them a hint of smoke. 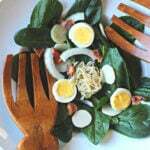 One minute Asian Vinaigrette Dressing. In under 1 minute, and with 5 ingredients you can whip up a tasty vinaigrette to splash over your favorite greens. Healthy. 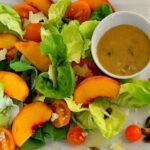 Butter Lettuce Peach Salad with Peach Pistachio Vinaigrette. Because we all need a perfect macaroni salad! This one will get you through every Summer pot luck, and BBQ gathering thrown your way. 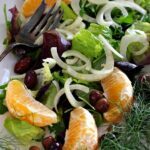 Crisp and refreshing with fennel, salty and sweet with orange and olives. 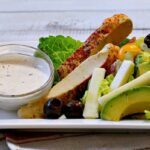 The vivid colors make this a salad you’ll want to dig into.